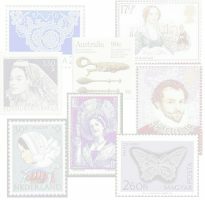 Many countries around the world have produced stamps with lace in some form featured on them. The stamps on the following pages are from my own collection - and I have many more to add as time permits. But if you have any images of stamps I could feature on this page, please contact me. Gidden, 1988. Lace in Stamps, Lace (Journal of the Lace Guild, England), No. 51, July 1988, p. 21. Gidden, 1988. Lace in Stamps Part 2, Lace (Journal of the Lace Guild, England), No. 52, Autumn 1988, p. 27. Contact Details - if you think you have any information that will help me with my research and these webpages.